5 stars - Utterly amazing. This is a story about memories and about letting go. It’s a love letter and a slow farewell between a man and his grandson, and between a dad and his boy. Such a sweet and touching read – easily devoured in one sitting. 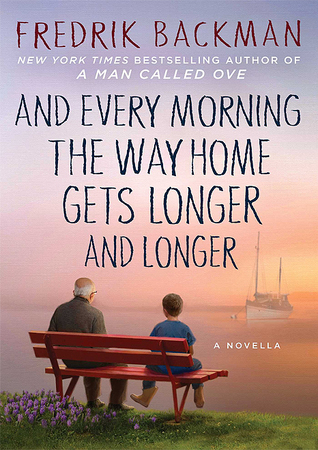 Backman does an amazing job of vividly putting into words the special bond between a child and their grandparent, while simultaneously displaying the heartbreaking, cruel effects of Alzheimer’s and similar diseases. It is a unique and contrasting combination of topics but the author dances between them beautifully. This story is told in simple but powerful words – one of my favorite writing styles. I particularly enjoyed how he described the world inside the grandfather’s mind; very creative and results in imagery that will not soon be forgotten. P.s. This will make you miss your grandparents if you have lost them, especially your grandfather(s). Favorite Quote: Isn’t that the best of all life’s ages, an old man thinks as he looks at his grandchild. When a boy is just big enough to know how the world works but still young enough to refuse to accept it. First Sentence: There’s a hospital room at the end of a life where someone, right in the middle of the floor, has pitched a green tent. I hope to read this soon but this soon. Great review. Sounds great, but I will probably need Kleenex! Kleenex wouldn't be a bad idea, Jennifer. I didn't find it to be overly sentimental or Hallmark-y though. Thank you, Dem! I look forward to your review whenever you get to it and hope you love it as well. Oh good - I'm looking forward to it.